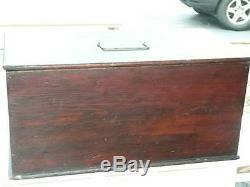 Antique Primitive Folk Art Large Lidded Box. 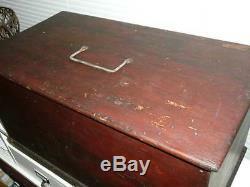 This is for an antique, primitive, folk art, all wood, trunk or blanket chest box. 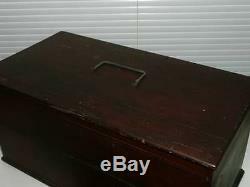 Large lidded box with metal handle. This box is amazing and very, very old. Normal antique wear with some rubbings here and there, see photos, hinges work fine, top opens/closes well, the metal handle is firmly in place, there are no holes or damage to the wood. Measures: 20 1/4" long x 11" wide x 9 3/4 tall. Please be sure you check the measurements for your intended purpose. We want our buyers to be happy. We will accept all reasonable offers. That means interested, serious offers. It should be expected that vintage and antique items are not always perfect. We try to be as accurate as possible in our descriptions, and we are very careful about disclosing any flaws or damage. We also include many photos with our listings. This is to provide our buyers with careful viewing of each and every item we post. We are not antique, nor vintage item experts. There may be a time where we may miss some a minor flaw, please be aware that this is not intentional, as we do not mislead our buyers. We are usually respond very quickly, and will provide as much information as possible to assist in your evaluation of the item. Items are not sent on approval. Please ask questions, read the description and see all the photos. At times we sell lots of linens and bedding items. Please note that most of them are used or gently used. Used and vintage items are not perfect, as there may be slight imperfections with items that were once loved, worn or used. We inspect carefully, and list what we see, but sometimes we may miss a minor flaw; this does not mean the item was "not as described, " because old linens and used linens are not new and perfect. If an item is new, it will be listed as such. New listings are added often, so keep checking. We use bubble wrap, foam, tissue, syrofoam peanuts, paper wrap and strong sturdy boxes to have your item arrive safe and sound. Thank you for your understanding. The postal service must receive the damaged goods in their original packaging and paperwork, before they will issue a claim. If an item gets damaged during transit, it is not our fault. We can't control how the postal service handles packages. TERMS: Almost all of the items we list have been preowned even if they were never used. They are not new and may show varying signs of age, wear yellowing from storage in linens and clothing. If we see any imperfections we will list and mention them in the listing, so please read the entire description. We try to describe items to the best of our knowledge and describe what we see, what we feel and we try to detail any flaws or imperfections. We are not vintage or antique experts. We also put numerous photos for you to look at. Unless we mention that we have personally drycleaned or laundered clothing and/or linens it is suggested and would be the responsibility of winner to have them cleaned/laundered. Sometimes we will list a vintage linen without having laundered the item, when that happens we state it in the description. We do our best to describe our items and we detail any flaws and show lots of photos. (Grossly misrepresented is a major flaw not mentioned in the description, minor flaws are not gross mis-representations, as our items are used and/or vintage). IF YOU RECEIVE AN ITEM AND WANT TO, OR NEED TO RETURN IT TO US, PLEASE DO NOT ALTER THE ITEM IN ANY WAY. IF THE ITEM IS A LINEN, CLOTHING OR FABRIC, PLEASE DO NOT LAUNDER, DRY CLEAN OR WASH BY HAND THE ITEM. IF IT IS A NON-FABRIC ITEM, PLEASE DO NOT ATTEMPT TO MAKE CHANGES OR REPAIRS TO THE ITEM. Below is a little of what we do to provide you quality service: 1. 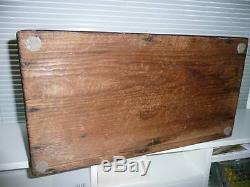 Most our items are used, not new, if new it will be posted as new, if used it will state it. We try our best to describe each and every single flaw that we see, that we feel, and that we know about, but used items are not perfect and a certain amount of imperfections that are normal and to be expected. We are not children and will do all that we can to ensure you are a happy customer. Thank you again for your business. Buttons by Vintage Inspired Studios. 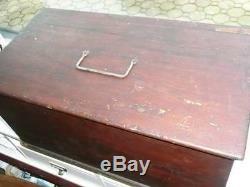 The item "Antique Primitive Wood Trunk Colonial Chest Primitive Folk Art Box Metal Handle" is in sale since Wednesday, February 10, 2016. This item is in the category "Antiques\Decorative Arts\Woodenware\Boxes".